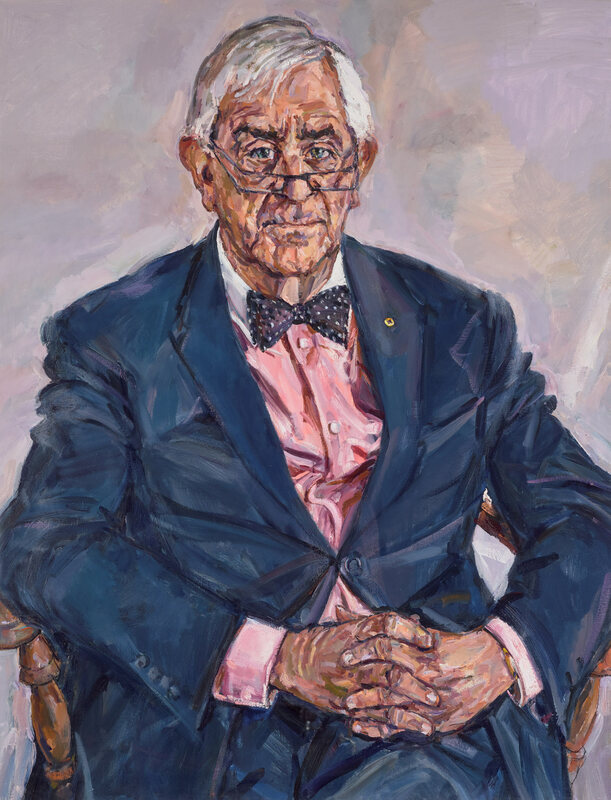 Bernard Teague AO was a judge of the Supreme Court of Victoria for over 20 years from 1987. The first solicitor to be appointed to the Supreme Court, he directed juries in more than 90 murder trials. Renowned for his passion, drive and appetite for work, Justice Teague was created an Officer of the Order of Australia in 2009. He has since presided over the 2009 Victorian Bushfires Royal Commission and an inquiry into the 2014 Hazelwood coal mine fire. In 2015, he was appointed chair of the Victim of Crimes Consultative Committee. Lewis Miller was commissioned to paint his portrait by Nerida Wallace, CEO of the Law Institute Victoria. ‘I had painted a portrait of a friend of Nerida’s, a filmmaker called Michel Lawrence, which she liked. Michel made a 15-minute documentary for Miro Films called A portrait of Bernie , which followed the process of painting this portrait,’ says Miller. Born in Melbourne in 1959, Miller completed undergraduate and post-graduate studies at the Victorian College of the Arts. He exhibits regularly in Sydney, Melbourne and Brisbane, and receives frequent portrait commissions from Australia and abroad. This is his 17th time as an Archibald finalist. He won the Archibald Prize in 1998 with a portrait of artist Allan Mitelman.